Below is a description of 16 designated backcountry campsite areas along the trails. 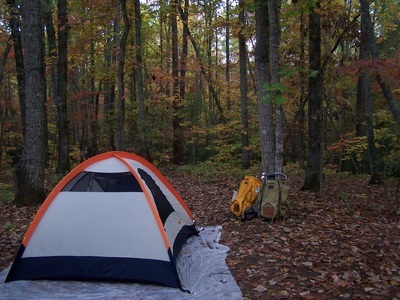 Camping is by permit only (and you must obtain your backcountry permit at the park office at least two hours before dark even if you have reservations) and camp only in the designated named campsite areas you have a permit for. See PERMITS for how to make reservations in the backcountry. As of December 6, 2018 individuals and groups will be able to make online site-specific reservations. There are some sites with only one fire ring thus a single permit site. The other sites have two lettered fire rings (there are small brown signs with letters and tent symbol by fire-ring (see example to right showing B at Beech Bottom.) The single permit, single fire-ring and the A site of two fire-ring camps can be reserved online. The B fire-rings of 2 fire-ring sites will be permitted out to “walk-in” persons at the park office. Single permit/fire-ring sites mean one permit for one person, couple or small group. 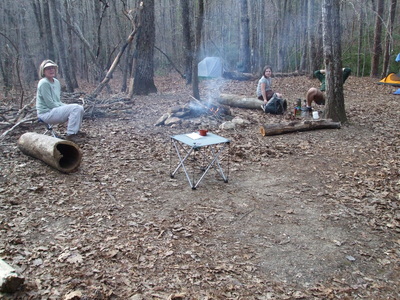 Two fire ring sites are “shared sites” by two individuals, couples or small group of 5 or less. 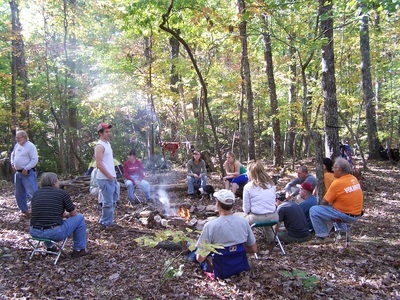 Large groups of 6 or more will be the only ones permitted at a site (this is for one or two fire ring sites.) If you don’t have a reservation, choice of available campsites is first come basis of sites that may be available on the day you arrive at the park office. IMPORTANT: you must be off the trail hiking to sites before dark. Park rules state NO alcohol consumption at all in the park except inside rental cabins & RV’s, so there is no drinking period in the backcountry (along the trail and campsites) nor at road side picnic areas and trailheads. Park rule: Axes, large knives and machetes, survivals blade tools are NOT allowed in the backcountry (nothing larger than a pocket knife/folding multitool.) If you need to cut up small dead/downed wood, bring a small folding hand saw. Pack out all your trash and help by taking out any left by others. NOTE: if you come to a campsite and find trash in the fire ring/camp or a smoldering fire, PLEASE contact the park office right away to inform the manager/ranger on duty (text/send them photos if requested and help by cleaning up trash). If you leave a campsite with trash or smoldering fire, you can be assumed to have left it and as the last permitted person there can be cited. 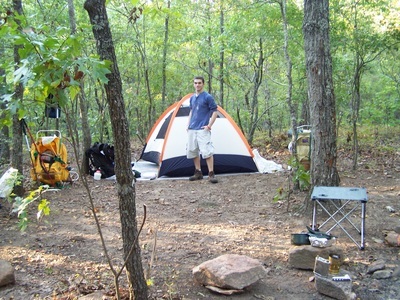 Campsites are regularly checked by park rangers and PMTA volunteers. Lastly, don’t build and leave ANY “wilderness beds”/tables etc.” Leave a site better than you find it. PLEASE only burn wood in a campfire and don’t try to melt down/burn any aluminum foil, metal cans, glass, plasticware (they are trash and haul it out.) No CHARCOAL either as it does not burn down well. Please don’t put candles on rocks by campfires either. At the time you obtain your backcountry permit, you will be offered a trash bag if you don’t have one. Here is a link to one page of information on Backcountry Camping you may want to review as an individual/couple or pass along to those coming with you in a group. While reading these descriptions, it is best to have an actual PMT topo style map in front of you. Maps are available from the PMTA on this website and the park office and some retail stores listed on our “store” here on the website. This campsite is located on the Chestnut Oak Trail just off the main PMT. You can get to this site from the west end of the Chestnut Oak Trail by parking across from the Gardens Country Store, hiking up Ga 190 a short ways to the rock wall entrance way of FDR State Park on the left. The Pine Mountain Trail sign is on the south side of the road on the right. Look for a sign for the Chestnut Oak Trail on your left (north side of the road). Hike the Chestnut Oak Trail east 1.7 miles to the campsite. (The entire Chestnut Oak Trail is 2.1 miles long.) OPTION: If you start off on the main PMT and come to Mile 1.4 at the Garden Overlook Parking Area, you cross GA Hwy 190 to the north. Just after you cross the road, there is a junction with the white blazed Chestnut Oak Trail that goes to your left (west). Little Bridges Campsite is located just down the mountain 4/10 mile from this junction. 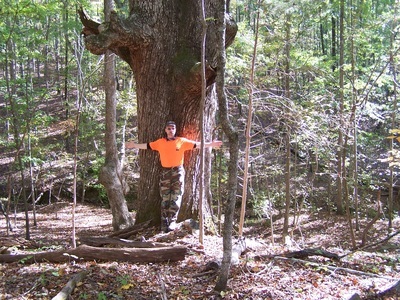 Large hardwoods are all around this beautiful camp. This camp was built to allow backpackers a close first or last night's camp. 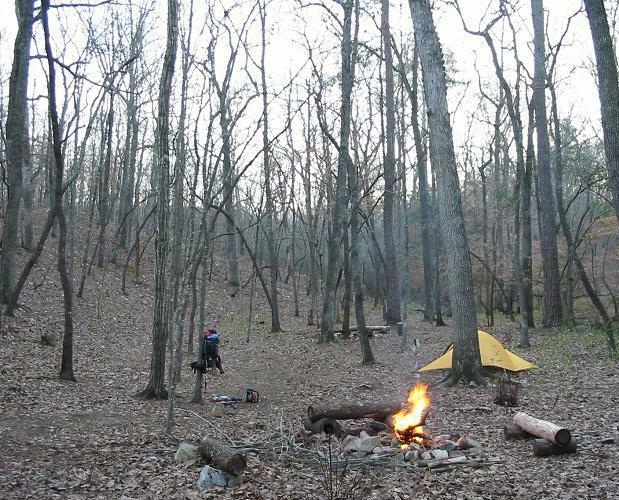 The distance to GA 190 will make it a good choice for first time backpackers or those with younger campers. There is a nice year-round spring beside the camp entrance that runs under a little bridge. This is a single fire ring single permit use site. Meaning only one person/couple or group of up to about 12-15 will be issued a permit for this 6 tent site. Thus if you choose this camp you not be sharing the camp. This is the first site on the main PMT starting from the west end. The site is located east past Mile 2 about 4/10 of a mile. You can also hike to the campsite from "No Name Parking Lot" which is only about a one half mile hike. From "No Name Parking Lot" there is a sign directing you to the Pine Mountain Trail via a dirt road off/away from the parking lot. After hiking this road a short ways you will pass the red blazed Mountain Creek Trail (which crosses the road) and you continue on uphill until you see the wooden Pine Mountain Trail directional sign. Turn right (west) there onto the blue blazed PMT. You will pass over the dam of the large CCC Hatchery Pond and continue on until you see the campsite sign on your right. The water source is from a spring the PMT crosses just west of the entrance to the campsite. There are two lettered fire rings at the campsite, thus if you choose this camp you may be sharing the camp with another individual, couple or small group of 5 or less. This site is a 10 tent 15 person site. 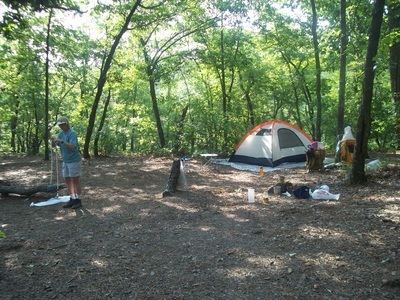 This campsite is located 1.6 miles east from the FDR Park Office on the main PMT. On this route you cross paved roads twice before you reach the camp just east past Mile 5 marker. If you park at Fox Den Cove Parking Lot, cross GA 190 and follow the PMT back to the west. Broken Tree Campsite is 6/10 of a mile west of Mile 6. The camp is on south side of the trail (heading east) in a small bottom just before you start back uphill. There is wooden sign on your right. This is a small camp for three tents at the most. In winter this is a warm camp, as a hill north of it should block the wind. There is an ample supply of downed, dead wood for campfires. There is a year-round spring right on the edge of the camp. This is a single fire ring, single permit use site, meaning only one person/couple or small group of about 6 will be issued a permit for this 3 tent site. Thus if you choose this camp you not be sharing the camp. The start of the access trail to Turtle Hollow Campsite is 1.4 miles east of Fox Den Cove Parking Lot on the Pine Mountain Trail. From Molly Hugger Hill Parking Lot it is about 3.6 miles west. There is a wooden sign and brown strip sign at the head of the of the access trail to the camp off the PMT. Follow the white blazed access trail down west some 780’ to another wooden sign. To the right of this sign is the main campsite which can accommodate a large group of backpackers (12-15 tents or around 30+ backpackers) but there is only one established fire ring. Water for this group size camp is a small spring stream that runs by the camp under the nearby bridge. For 1-4 people with 2 tents max use Turtle Bluff. At the sign is a footbridge. Cross the bridge and follow the trail up a short ways to Turtle Bluff. This small sub-camp, overlooks the spring stream below. There is room for only two tents and again there is one established fire ring there. Even if there is a group staying at the main Turtle Hollow Campsite, Turtle Bluff is across the spring and up the hill enough to offer “privacy” for backpackers away from a group at the main campsite. From Fox Den Cove parking lot (Mile 6.2), go east on the PMT (north of GA Hwy 190 away from the parking lot). The hike to Big Knot takes you past a large rock cliff (Fox Den Cliff) near Indian Mountain. Down the slope away from the top of the mountain, the trail views to the west are spectacular. The trail crosses a small wooden bridge just before an uphill climb and trail to the right for the site. Mile 8 is just past the campsite sign. The site is on small ridge. Water source is a small clear spring, which is located just at the bottom of the ridge to the east of the campsite about 100 yards or so. There are two lettered fire rings at the camp that are a pretty good ways apart, thus if you choose this camp you may be sharing the camp with another individual, couple or small group of 5 or less. There is room for about 10 tents and 20 people. Established in October 2008, it is 3/10 of a mile east of Mile 8. From Fox Den Cove Parking Lot, hike east 2.1 miles. You will cross a small spring with bamboo on your right then the access trail to the campsite is just beyond that on your left (the north side of trail). From Mollyhugger Hill Parking Lot, hike west 2.8 miles. The access trail will thus be on your right then. Follow the white-blazed access trail across a small bridge to the site. The water source is marked with a sign in the northwest corner of camp. The boundary of FDR State Park is approximately 200 yards north of the campsite. This is private property beyond the boundary. Please note the marks on the trees and stay within the park. There are two lettered fire rings. Thus if you choose this camp you may be sharing the camp with another individual, couple or small group of 5 or less. There is room for about 10 tents and up to 20 people. Just to the east of the Mile 9 marker, the trail runs alongside a stream and makes a slight turn uphill (east) and the campsite location sign is on the north side (left) of the trail. This well used campsite is moved (relocated) from east to west side (and back) of the water every couple years to keep effect of compaction down. Be aware the old locations are not to be used (there are signs that point out the current/authorized site and that the old site area is closed). There is a 12 foot bridge over the water on the path leading off the PMT to the current site on west side of the creek. If you leave Molly Hugger Hill Parking Lot and go west on the trail, you have about a two mile hike in. You go down and up several times with some pretty good switch-backs west of Mile 10. The site is a flat cleared area under some tree cover of Beech Trees. Be aware of the signs at the back (north side) of the site that mark the boundary of FDR State Park. The pines beyond there are private property. The beautiful water source running alongside the camp is one of the best of all the campsites and can be counted on all year long. There are two fire rings at the camp, thus you may be sharing the camp with another individual, couple or small group of 5 or less. There is room for about 10 tents and 20 people. 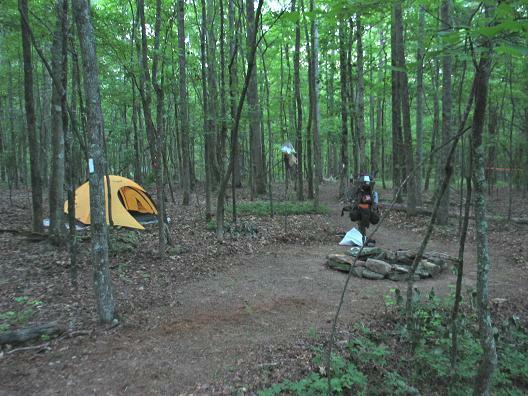 Of the sixteen backcountry campsites, fourteen of them are located on the main Pine Mountain Trail. Grindstone Gap is located on the white-blazed Sawtooth Trail (Little Bridges is on the Chestnut Oak Trail). To get to Grindstone Gap, you can go west on the PMT (south of GA Hwy 190) from Fox Den Cove Parking Lot and then hike east on the Sawtooth Trail about 1.9 miles. If hiking from Mollyhugger Hill Parking Lot, go across GA 190 to the south and onto the PMT just a short ways, then hike right (west) on the Sawtooth Trail about 8/10 of a mile. The sign for Grindstone Gap Campsite, is located in a bottom. The site is several hundred feet off the trail to the south in a nice flat area. Water is not reliable in warmer months but is ok until late summer and runs right by the first fire ring. There are two lettered fire rings at the camp pretty far apart. If you choose this camp you may be sharing the camp with another individual, couple or small group of 5 or less. There is room for 10 tents or 20 people total. If you park at Mollyhugger Hill Parking Lot, and cross the road (south of GA Hwy 190) you are going east on the trail down the mountain. About .4 mile in you come to large rock and a sign on the right. Follow the site trail to the three tent sites on the hillside. This site was reworked in 1998-1999 as an Eagle Scout project. In 2001, Scouts reworked the access trail. 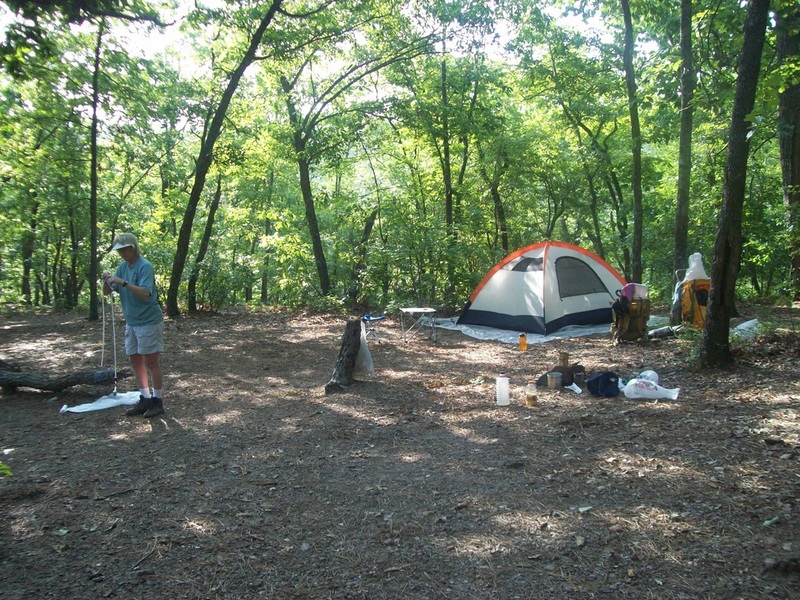 There are only three tent sites and one fire ring just below the tent sites with a nice sitting area. Water: It is a 1/4 mile down a marked water trail to a small spring southwest of the site. Since there is the one fire ring at the camp, and room for only 3 tents, this is a single permit use site, meaning only one person/couple or small group of about 6-9 will be issued a permit for this site. 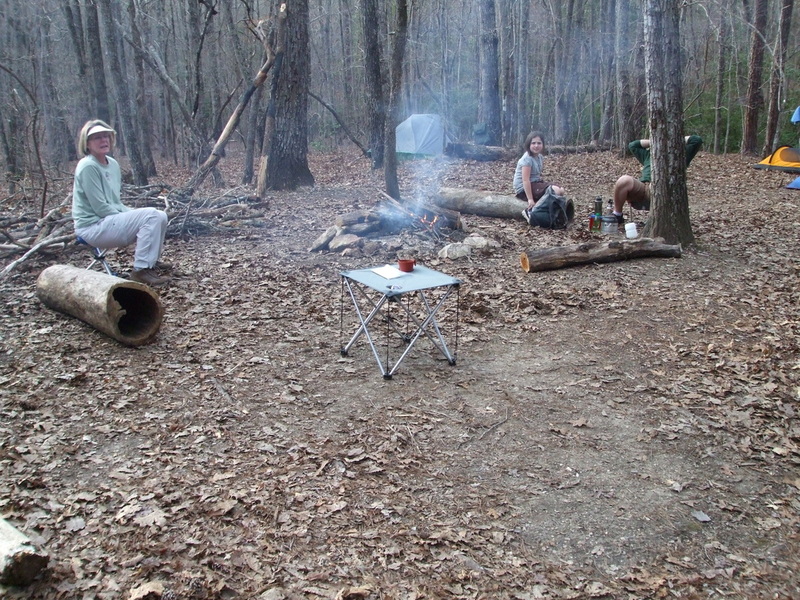 A great little campsite about in the middle of the Pine Mountain Trail…. 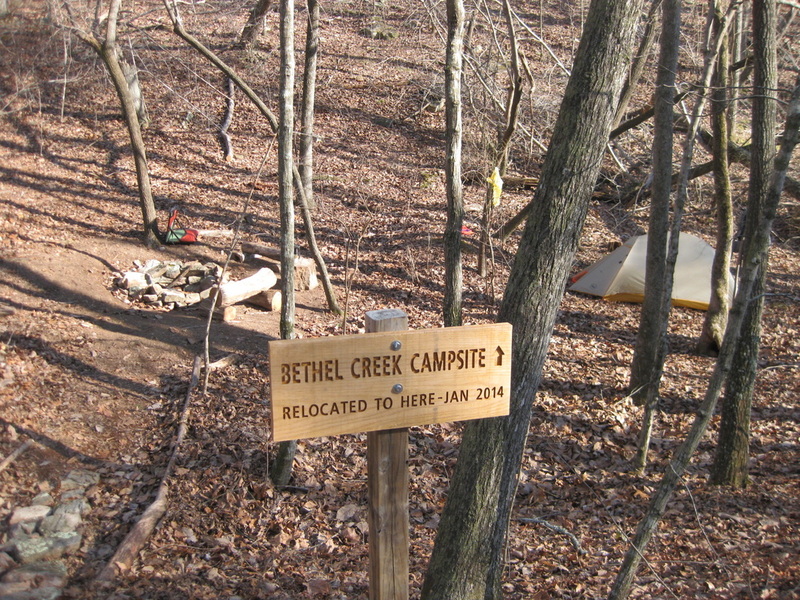 On January 25, 2014 volunteers with the PMTA relocated Bethel Creek Campsite (in name) 2310 feet or about 4/10 of a mile east of the old location (east of Mile 13 marker 600’.) This is 737 feet west of the BootTop Trail/Pine Mountain Trail intersection. 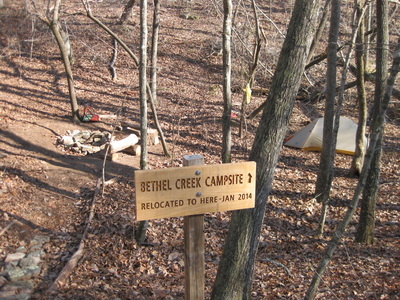 The original Bethel Creek Campsite location was wiped out in a 2011 tornado. The original site could not be maintained (nor had any tree cover). The new campsite location is somewhat smaller than the old one and will accommodate at most 5 tents or ten people. 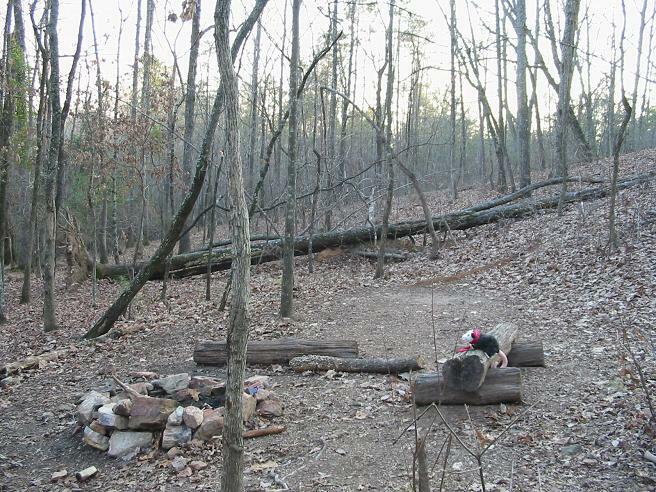 The site is located in sight of the Pine Mountain Trail a short distance off the trail, south side. There is only one fire-ring authorized here (so like all PMT backcountry campsites please don’t add fire-rings or move them.) The one grand fire ring is the best of all the PMT campsites. There is downed wood near the site. With water nearby, campfires are permitted (unless a fire-ban park wide comes up.) The main Water source is a year-round spring-head, just 140' west of the campsite (just 27' off the trail), however in cooler months water flows past the camp itself under a walkway bridge. . Old Bethel Creek Campsite now has an engraved sign there by the trail noting it is closed (no camping or fires there). It was located 1,710' west of Mile 13. Note: on the PMTA map (2015 and newer) the site is located correctly. On 2013 and older editions of the map, the old site was/is shown west of Mile 13. Where the old campsite was, there on the 2015 map only (by mistake) is an unnamed tent symbol. There is only one fire ring at the new camp location, and again there is room for only 5 tents. This is a single permit use site, meaning only one person/couple or small group of about 10 at most will be issued a permit for this site. Directions to the site: From the west once you pass Molly Hugger Hill Parking Lot (Mile 11.2) continue to travel east on the PMT past Mile 12, cross Hines Gap Road, through the tornado damage areas to just 600’ past Mile 13 to the site. Coming from Dowdell Knob Trailhead (Mile 14.5) come west past Mile 14 downhill on the trail, past the BootTop Trail intersection 737 feet on west to the site. There is a wooden sign by the trail leading off the PMT to the camp, and a brown thin Carsonite sign on the opposite side of trail with arrows pointing to the camp and down to the water source. 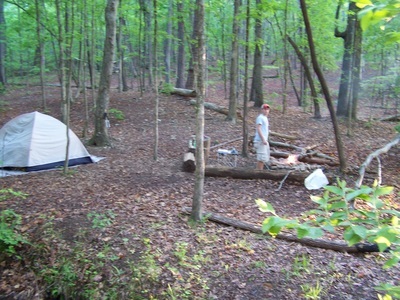 Built in 1998, the campsite is north of the trail just west of Mile 16, just east of the small waterfall near Brown Dog Bluff. Uphill past the entrance sign about 80 yards you find a nice flat area and two fire rings. There is an ample amount of dead wood all around the site. 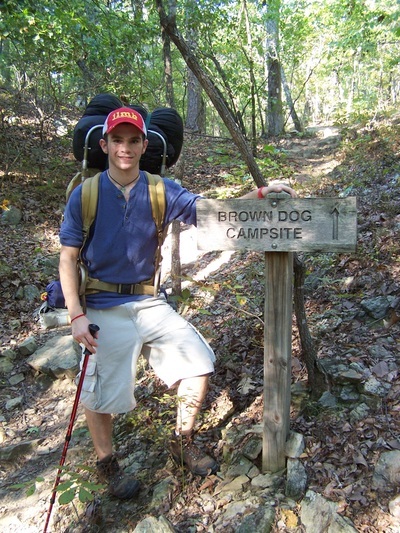 To get to Brown Dog Campsite you can hike in from the Dowdell Knob area east about 1.5 miles or park at Rocky Point Parking Lot and hike in west about 2.1 miles. You can also hike in from the Boot Top Trail Parking Area, and then hike the BootTop Trail east to the end of it, then hike west on the PMT to just past Mile 16. The water source is the spring and waterfall mentioned above. There are two lettered fire rings at the camp, thus if you choose this camp you may be sharing the camp with another individual, couple or small group of 5 or less. There is room for about 10 tents or 20 people. 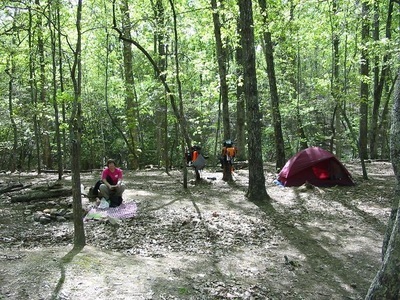 The campsite is now located on the west side of Sparks Creek just across the creek from the previous location. This is just west of Mile 17 about 2/10 of a mile. It was relocated May 17, 2014. The old site had become so compacted from use over the years and “bad campers” had cut down numerous trees including all the dogwoods. 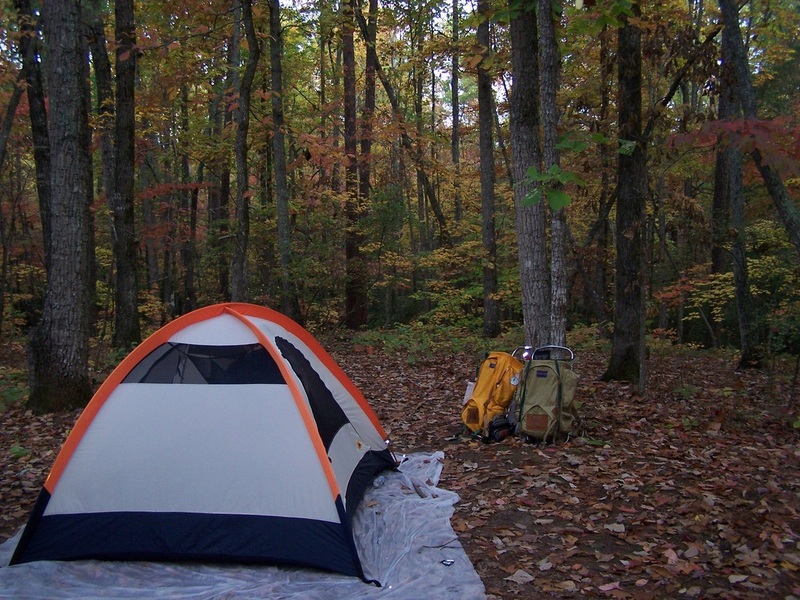 One of the main sources of compaction is not just a site being used, but campers NOT fluffing up the leaves where they had put their tents when they get ready to leave a camp. Directions: The hike in from Rocky Point/Mile 18 is the best (it is about 1.2 miles.) The trail comes down through the cliffs at Rocky Point and it’s downhill all the way. Just west of Mile 17; the trail turns left and you cross Sparks Creek on stepping stones and the trail continues along the stream a short ways, then uphill about 100 yards to the signs that mark the campsite. Take the short access trail downhill from there to the site. Alternate directions: Go east on the PMT from Dowdells Knob, past Brown Dog Campsite about a mile. NOTE: there was a bridge to cross to get to the old site that has been removed. The new access trail is west of the old bridge location. The old bridge that used to lead to the old site has been made into a nice bench at the new site near a fire-ring. Watch for signs showing the boundary of this site and noting the closure of the old site. There are two fire rings at the camp, thus if you choose this camp you may be sharing the camp with another individual, couple or small group of 5 or less. There is room for about 6 tents and upwards of 15 people. The access trail to Big Oak Springs Campsite, starts off the Pine Mountain Trail about .8 of a mile west of Rocky Point Parking Lot/Mile 18. If you are coming east from say Dowdell's Knob the site entrance sign is just about 500’ east of the PMT Mile 17 marker (which is east of nearby Sparks Creek Campsite). This campsite holds about 20 people and 10 tents. Follow the white blazed access trail off the PMT 495 feet down to the main part of the camp and the one established fire ring. The water source for the camp is further down the access trail just 250 feet to a beautiful rocked in spring head. Across the spring stream is evidence of two “whiskey stills.” Above the spring you will see a HUGE white oak tree, hence the name Big Oak Springs. NOTE: Please place tents left/north of the fire ring, as to the right are red signs warning no placing tents near the historic old house-place rock piles. There are signs on the west side of the camp telling of no camping there (again, an old historic house foundation area.) Since there is the one fire ring at the camp, this is a single permit use site, meaning only one person/couple or group will be issued a permit for this site. 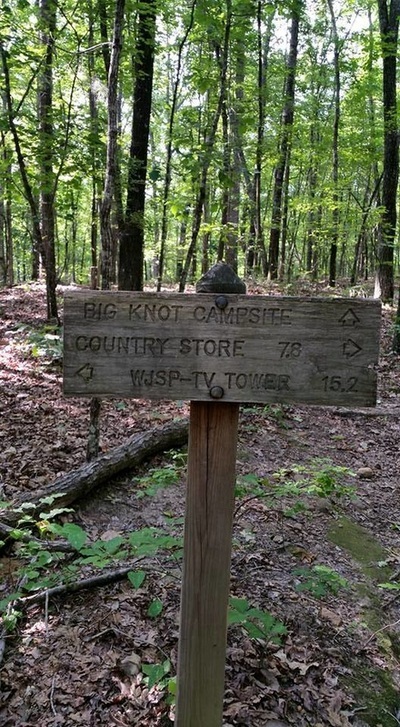 Most hike to the campsite starting in from the WJSP-TV tower/Mile 23 trailhead. Hiking west on the trail some 4.6 miles to the site. You can also take an easy hike in from Rocky Point Parking Lot (cross Ga. 190 north from the parking lot) and head east some 4/10 of a mile. West, just before the site is small wooden bridge that you cross and continue uphill on the blue-blazed PMT to the site on the left. There is at times water available here. The site is located on a flat hill top. This is a large site and was a favorite of scout units in the past but be aware it is NOT suggested for group use now as there is no water reliable most times late summer west and east of the site for the last couple years (only some runoff water after a rain at times May- September). Since Sassafras Hill has NO reliable water nearby it is now designated by the FDR park manager as a dry camp and NO campfires allowed there at all unless you are told otherwise upon arrival to obtain your backcountry permit at the park office. Best would be careful use of stoves only there for now. If there is water, there are two fire rings to use. Thus if you choose this camp you may be sharing the camp with another individual, couple or small group of 5 or less. There is room for about 10 tents or 20 people total. Most people hike in to this site area from the Mile 23/ WJSP-TV tower parking lot trailhead (about 2.7 miles). The hike in to Old Sawmill is one of the most scenic, with lots of hiking over water crossings and hills, past cliffs and waterfalls including Cascade Falls. An alternate route is hiking in from the west, and it is about 2.3 miles east of Rocky Point Parking Lot trailhead. The site has the best water source along the trails. This being a good sized stream alongside the trail, on the edge of the camp. The best access point to the stream is noted with a sign, just 75 feet east past the entrance to the camp. The old location of the campsite is not to be used AT ALL, and the sign at the old location entrance (is now blocked) tells this. There are two lettered fire rings at the camp, thus if you choose this camp you may be sharing the camp with another individual, couple or small group of 5 or less. Most people hike in to this site west from the WJSP-TV tower/Mile 23 trailhead. The site is located at the end of a fairly steep switchback uphill climb just past Slippery Rock Falls, about 1.5 miles in. The water source is way back down the trail at the bottom of the hill east of the camp at Slippery Rock Falls. Please stay on the marked blue-blazed trail in and near the campsite area when going for water. Note: if you have a campfire, be prepared to haul about 3 gallons of water up the hill to put out the fire (or don't have a fire.) Remember, if you have a fire at night and not in the morning you still need to drown the likely smoldering coals in the ashes! We of the PMTA (and park rangers) have found way too many smoldering campfires at this camp due to folks not willing to haul water up to drown their fire. This site is checked often post use. 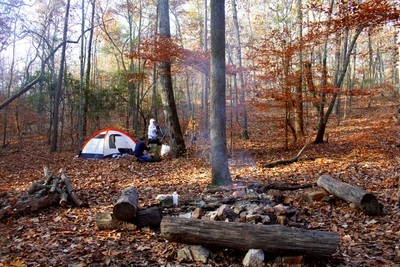 There are two fire rings at the camp, thus if you choose this camp you may be sharing the camp with another individual, couple or small group of 5 or less. There is room for 10 tents or 15-20 backpackers. NOTE: There are some dead pine trees cut down at the camp in April 2017 that were infested and have been sprayed with chemicals. DO NOT burn their wood. There is lots of cut up dead oak around the edge of the camp.